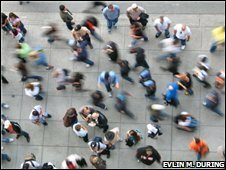 BBC Science has an interesting article on how the whereabouts of more than 100,000 mobile phone users have been tracked in an attempt to build a comprehensive picture of human movements. It turns out that most people also move less than 10km on a regular basis, according to the study published in the journal Nature. Mobile phone data is not widely available and while interesting to track general movement where it become of more use is via GPS and the movements of crowds. Currenty GPS handsets are expensive and battery hungry but in the next few years we are going to be increasingly ‘location aware’ allowing better understanding of our movement in cities. Also for those interested see our post on the Nature Network ‘Connected to the World but not the City‘ for a view of location based services and the prospect of mass market gps enabled devices. There’s a great bit in Neal Stephenson’s Cryptonomicon, where one of the characters figures that you could build a map of roadways by recording the movements of people on them. I can’t recall where exactly (and I don’t have my copy handy) but this reminded me of it.